Ali is too young to fast from dawn to dusk. His Mom allows him to fast for a day this Ramadan and Ali eagerly waits for the Ramadan month to begin. He experiences a myriad of emotions through the day and learns the essence and the true spirit of Ramadan. He celebrates Eid-al-Fitr with his family and friends with zest and fervor. 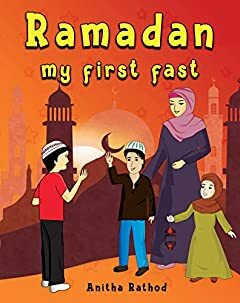 As Ali takes us through his first experience of the Ramadan fast, we learn the traditions and significance of the holy month of Ramadan. Ramadan is not just about fasting; it is also about devotion, compassion, and patience. The Series "Unravel Festivals" is all about discovering traditions and customs associated with different festivals. Festivals are integral to the cultural and social life. They bring us all together and add exuberance to our lives. Festivals have a way to cut across different regions and cultures. Every festival comes with an interesting story and through these stories, we understand and appreciate the true meaning of our culture and values. So, let's explore these festivals and learn to celebrate them the right way. As we learn to appreciate the reasons behind the festivals, customs, and traditions associated with them, we can truly enjoy and follow them for generations to come.